Lovely stone 3 bed cottage in quiet village with delightful views. The cottage is semi-detached with its own entrances and the owners occupy the other house. It has 3 bedrooms for 5; one 5' double, one twin and one single. A bathroom with spacious walk in shower - sorry no bath - and a comfortable cloakroom downstairs. Entrance lobby for removing your outdoor gear, well equipped kitchen with electric oven, microwave and dishwasher (bring your slippers as the tiled floor can be cool), dining room with log burner and sitting room with an easy to light gas stove when you are shattered after a hard day outside. Finally a good utility with washing machine, tumble dryer and fridge - freezer available in the bike shed - and space to hang up soggy gear. Gas central heating, wood, towels and bed linen, soap powder etc all included. Terraced space to the side for parking and sitting and a lawned front garden to watch the world go by. The outlook from the front garden will be more open, probably for most of this year as sadly, we are having to take down a tree that lost a big branch late last year. We have decided that it sensible to clear the border at the same time so for those of you who have visited before, it will look a little different for a while. A rather temperamental broadband supply and mobile service depending on who you are with but recently a good 4G service, Freeview television and an excellent selection of Blue ray DVDs, books and games. Children over 8 preferably please. Babies and little children are welcome but the house is not best equipped for them. The stairs can be shut off at the bottom and fire guards are available. Up to 2 well behaved dogs by arrangement....the garden is not escape proof for dogs as one of our reviews has pointed out; all official exit points are gated but a determined canine will get round them. House rules are no dogs upstairs and not on the furniture please. They have a very nice bed of their own. Parking: the gateway for the parking space for the house is tight and from the narrow lane of The Green and you must reverse onto it. However, small cars can go in forwards, we do get our Land Rover Discovery on it and it does allow you to remain more private from us. One review described it as inaccessible but for most folk and vehicles it works. However, if it doesn't suit and you are going to be using your vehicle a lot, you are very welcome to use the main driveway which is easier; you can come in forwards and can also be made available for second vehicles. Third vehicles require a little more effort and there is also a reasonable spot on Hollowgate, just past the house. Please note changeover days are generally Fridays and Mondays. However, I shall do my best to offer other days where possible. My husband and I are originally from Sheffield. 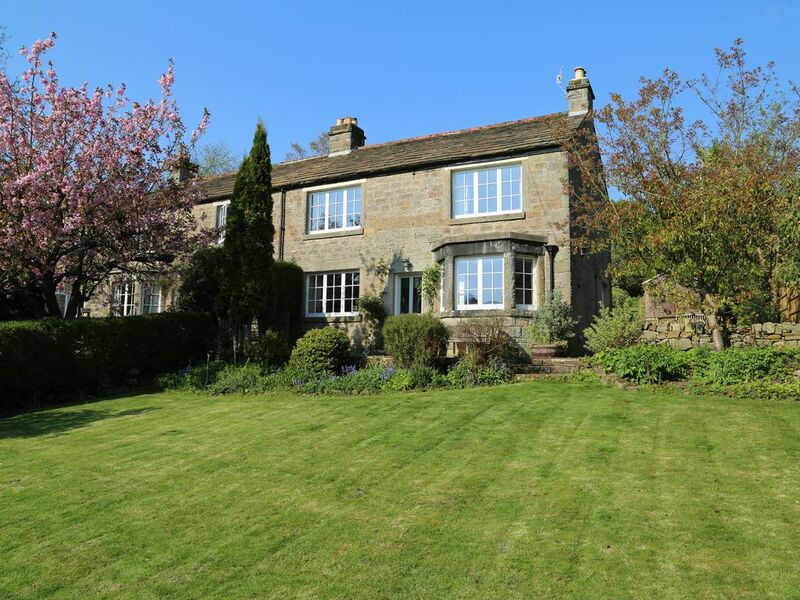 We meant to stay in the city but Froggatt beckoned when we needed a new home on the south side. Needless to say 22 years have flown by and we're still here because it's lovely. Four grown and growing children and two labradors means we are still a busy household. We are in and out but hopefully, you can enjoy this terrific place too in peace. We still have many places left to visit in the National Park and Derbyshire and the walking options must be infinite. There is plenty to do inside and out all year round. Chatsworth will be open again soon; always worth the financial outlay to visit. Lots of routes for walking from the door or hop in the car to a different starting point. There are some lovely bike trails a short or shortish distance away as I hesitate to recommend cycling for little ones around us on the roads. Spring is a lovely time of year and Autumn can be beautiful - bright sunny days and cold clear nights; lots of tree colour and heather on the moors from August. Our visitors do love the view across the valley from the front of the house and when the leaves fall off, the famous Froggatt Edge can be seen. So we are well positioned for climbers and walkers. And finally, quite a few of our guests last year stayed for weddings - we are very close to the Maynard in Grindleford, Fischers in Baslow, Hassop Hall Hotel, The Cavendish in Baslow and The George in Hathersage;if they can't fit you in! Please read our reviews. I feel these tell you more than I can. Family bathroom upstairs with spacious walk-in shower, basin and toilet. Heated towel rail, tiled floor. Spacious downstairs cloakroom with hand basin. Gas central heating. Radiators in all rooms. Mostly Egyptian cotton though always cotton. Lower sheet, upper sheet on request ; feather and down duvets and pillows and bed spread/throw. Synthetic duvets and pillows now available. Rotary dryer stored in the shed for good weather. Efficient 'Wood burner like' gas stove in the sitting room. Not the best connection but excellent on a good day. Wood burner in the dining room. All wood included. Three piece suite, Freeview TV, DVDs, games. Gas Stove. Dishwasher tablets and rinse supplied. Large larder fridge in the utility room. Freezer available in shed with ice for drinks. A Nespresso pod coffee machine with milk heater has been added along with the filter jug. Please bring your own pods, filters and filter coffee. Instant coffee supplied and pods for a small charge. Tea, fruit tea, instant coffee, sugar, salt and black pepper. Milk on arrival. DAB radios in the kitchen and bathroom. 'Pure' sound system in the sitting room. Excellent selection of mostly Blu-Ray and standard DVDs. Guide books available for walking with but please return. Local history, Derbyshire wildlife and plenty of fiction. Outdoor table tennis available when the weather's nice. Mix of board games and jigsaws. Puzzle books and colouring books. Good stock of Blue Ray DVDs available. Outside seating at the side of the house and at the front for the view. Outdoor cushions and blankets supplied. Stored in the utility room. Umbrella in the bike shed plus two loungers. Rotary dryer. We have storage available in the bike shed by the main drive - fixed bike rack and a big lock should you wish to use it. However you do require your own insurance. Local clubs with 18 holes - Sicklehome in Bamford and Abbeydale over the hill in Sheffield. Walton at Chesterfield. 9 holes available at Bakewell and Chatsworth. Shoe polish in house for wedding guests! We really enjoyed our break in valley field. Very well equipped and comfortable cottage with beautiful views and in a lovely area.Wonderful walks from the door and plenty of good pubs with great food in the vicinity. A really nice house to stay in. We particularly liked that we could access so many walks from the house, without needing to take the car. At the same time, it was easily accessible by car to many places in the area. The house was really clean and beautifully furnished. The view was fantastic and there was a very nice garden. We felt very welcomed by the hosts. Would revisit if parking was good and an ensuite added as house has everything else. Walks straight from door. Coffee shop a flat mile away and a pub uphill 15 mins in November. after our conversation when you were here, I am very sorry that the quality of the parking arrangements were such that you felt we only deserved a three star review. I am also sorry that the main driveway wasn't suitable for you either. Furthermore, an ensuite bathroom would be delightful but I don't know where we could sensibly put one in. I have added more detail to the main description of the house on the website to inform others and suggest that future guests also look at us on Google Earth to view the site and its access. Our second trip and we will be back- best holiday home we’ve ever stayed in. Attention to detail, quality and comfort is second to none. This has got to be the best cottage I have stayed in. Its immaculately clean and very modern. The quality of furnishings is outstanding and attention to detail absolutely fabulous. The owners have literally provided everything you need, from little things like food bags, cling film, to picnic baskets and thermos flasks to dubbing and brushes for your walking boots. And we were welcomed with a proper Bakewell pudding and cream. The location of the cottage is ideal for lots of walks, is peaceful and has stunning views out of all the windows.